Birthday party season is here which means tons of sweets and little treats for our household. My kids recently discovered Marshmallow Fruity Pebbles and they want to eat the cereal all times of the day. 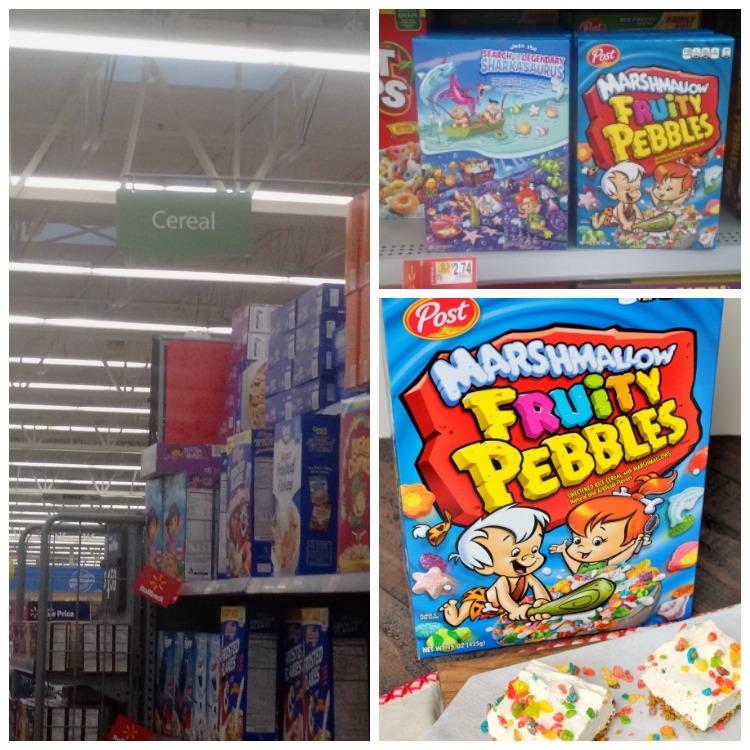 Even though Fruity Pebbles cereal has been around since 1970, the marshmallow version is new and quickly becoming popular. My kids love it so I decided to make a yummy treat for them using the cereal. It is still so hot outside though so I didn’t want to turn on the oven. Instead, I made no bake cheesecake bars. These no bake cheesecake bars are so easy to make and they are the perfect thing to get the kids involved with too. No hot pans or ovens to worry about. 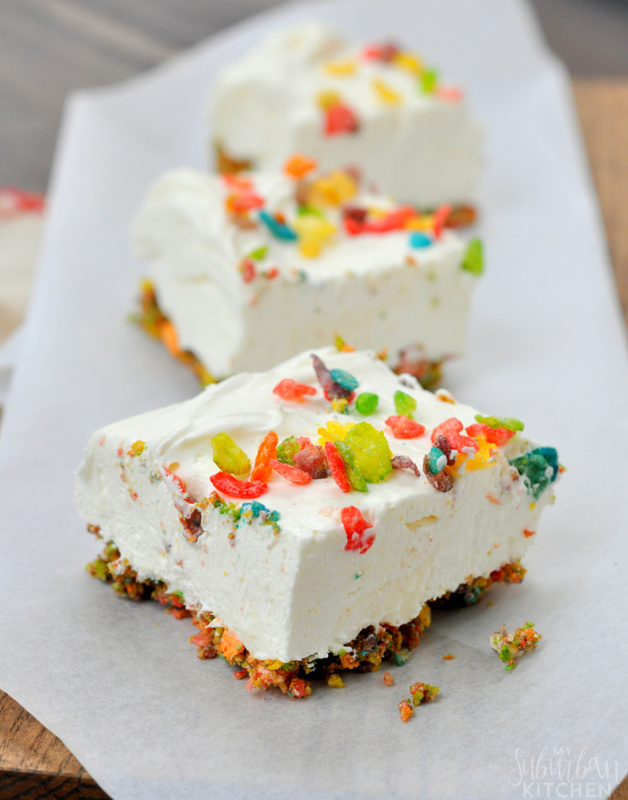 Plus, they will love smashing up the Marshmallow Fruity Pebbles to make the crust. Just stop by your local Walmart for all the supplies and then you’ll be ready to make them. 1. Line a 9×9 baking pan with parchment paper leaving the ends to overhang a bit. Crush 2 cups of Marshmallow Fruity Pebbles and mix with 2 1/2 Tbsp melted butter. Press into bottom of prepared pan. Set aside. 2. In a food processor or mixer bowl, beat cream cheese and butter until smooth. Add sugar and vanilla and mix well. Fold in Cool Whip. Spread over prepared crust. Top with remaining 1/4 cup Marshmallow Fruity Pebbles cereal. Refrigerate for 4+ hours. 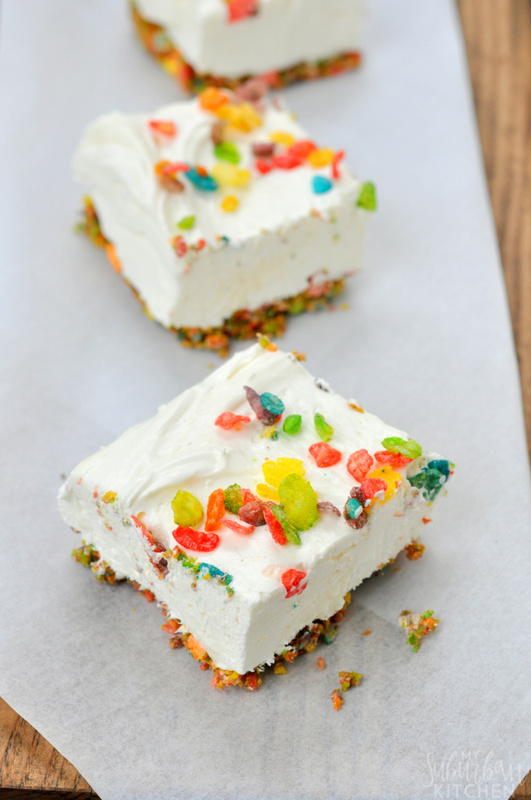 We all loved these no bake cheesecake bars! 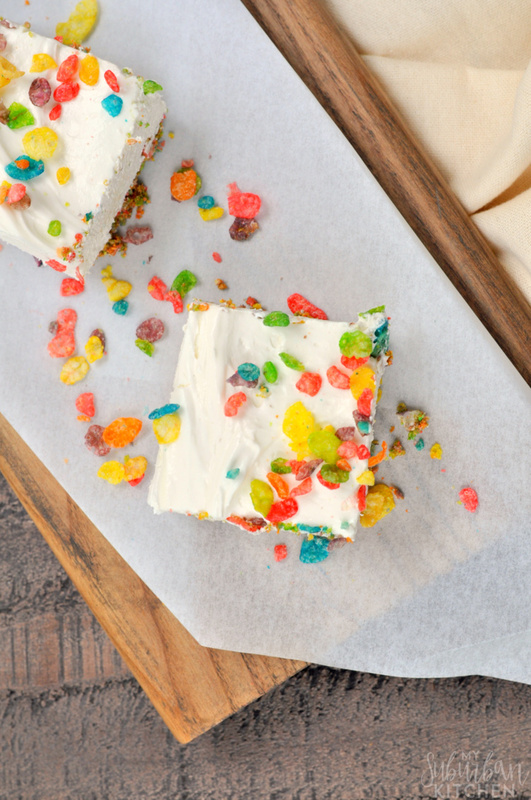 The Marshmallow Fruity Pebbles add the perfect amount of of fruit flavor to the special treat. My kids think they are getting a great dessert so I don’t let it slip that the cereal is a naturally low fat food and an excellent source of Thiamin, Riboflavin, Niacin, Vitamin B6, Folic Acid, Vitamin B12! What are your favorite cereals? Do you use cereal for recipes and snacks too? We love eating it outside of the typical breakfast time. Line a 9x9 baking pan with parchment paper leaving the ends to overhang a bit. Crush 2 cups of Marshmallow Fruity Pebbles and mix with 2 1/2 Tbsp melted butter. Press into bottom of prepared pan. Set aside. In a food processor or mixer bowl, beat cream cheese and butter until smooth. Add sugar and vanilla and mix well. Fold in Cool Whip. Spread over prepared crust. Top with remaining 1/4 cup Marshmallow Fruity Pebbles cereal. Refrigerate for 4+ hours.